Pathways, a program of The Connection, provides support, education and wellness programs for women with cancer, creating a community in which shared experiences lead to personal growth and healing. Pathways is committed to empowering women to recognize their strengths and encouraging them to make choices that enable them to become their own self-care advocates. Pathways is one of the only local organizations that provides direct services to women with cancer. Programs are available free of charge to female cancer survivors. ​Please call or email Lesley Andrews to inquire about our programs – (908) 273-4242 ext. 154 or pathways@theconnectiononline.org. Registration is required for all programs, classes and events. To make a general donation to The Pathways SOS Team, please click here and select the "Pathways SOS Dragon Boat" Campaign. Pathways Team SOS ("Save Our Sisters") NJ was created to offer women a low impact physical activity that helps relieve stress, improve fitness, and gain strength. This sport allows us to share our experiences, to heal, and to enjoy the camaraderie of our dragon boat team sisters in a serene setting. We range in age from mid-twenties to mid-seventies and com from all over northern and central New Jersey. Some of our team members are currently going through treatment, while others are longer-term survivors. Socially...women expand their social network and develop enduring friendships with other women who share in their experiences. We call our team a "floating support group." ​Past: The origin of Dragon Boat Racing dates back over 2000 years to the Chinese legend of Qu Yuan, a 4th-century statesman, poet, and advisor to the king. Qu Yuan was exiled from the ancient state of Chu after his advice to the king was misinterpreted as an attempt to assume greater political power. For his offense, Qu Yuan was banished to a remote area of Hunan Province in southern China. Present: Today, Dragon Boat Racing is one of the fastest-growing water sports in the world. The World Championships of Dragon Boat Racing have been held annually in Hong Kong since 1976. In 1991, the International Dragon Boat Federation (IDBF) was formed in response to the explosive growth of the sport. Based in Hong Kong, the IDBF boasts over 100 member organizations in more than 40 countries. Since 1995, World Championship events have been awarded to Canada, China, New Zealand, England, Australia and the United States. A Commission was developed to oversee the standardization of equipment, rules and regulations. Within a relatively short period of time North America has emerged as an international Dragon Boat Racing powerhouse. What’s most exciting is the growth of the sport at the grassroots level. Dragon Boat Racing is great fun for anyone, young or old. Participants of any level of fitness can quickly adapt to and develop a passion for this sport. Although most international crews are either all male or female, national and regional events attract primarily mixed teams from corporations, public service groups, and clubs sponsored by small businesses and high schools. 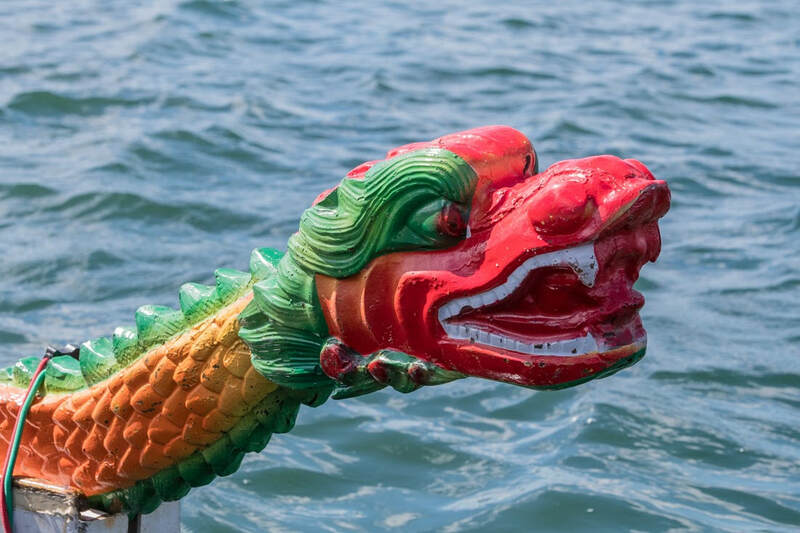 Dragon Boating & Breast Cancer Survivors: In 1996, Dr. Donald McKenzie, a Canadian sports medicine specialist at the University of British Columbia, started a dragon boat team for women with a history of breast cancer. The women formed the team Abreast in a Boat and tested Dr. McKenzie’s belief that this activity would benefit breast cancer survivors by providing upper body activity in a challenging and supportive environment. Breast cancer survivor dragon boat teams caught on in Canada, Australia, the United States and other locations around the world. The International Breast Cancer Paddlers’ Commission (IBCPC) has emerged and encourages the formation of breast cancer survivor teams. This international network of BCS teams periodically generates an international festival and competition in which members of Pathways Team SOS have eagerly travelled the world to participate.